Next, go to Setup – Products & Reservation Rules – [select room to edit] – Reservation Rules. Set the weekend restrictions in the Length of Reservation section. This option will require that a reservation must be at least two nights, but it doesn’t define which night over the weekend it must be. If a customer attempts to book a reservation for a Thursday and Friday night, then the system will allow the reservation because it satisfies the 2 night minimum rule. 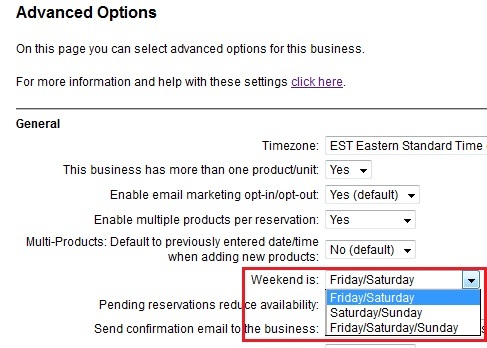 This option will require that a reservation meets the Weekend definitions that you have set in the system. For example, your weekend is Friday/Saturday, and a customer attempts to book for a Thursday and Friday night. The system will either accept the reservation and make a rate adjustment for an extra night (Saturday) or not allow the reservation at all (depending on what is set in the Reservations section in the Advanced Options of the Business Information). With the Rate Adjustment, the system will accept the reservation, but charge the customer the rate for the requirement, i.e. Friday AND Saturday night. In the example below, the total rate includes the rate for Saturday night even though the customer will only stay Thursday and Friday night. Based on these two options, what makes the most sense for your business? Our recommendation is to consider each option carefully for your business. While the Weekend Stay Required might be necessary for your business, it is important to bear in mind that a customer might be displeased about receiving an error message that the reservation isn’t allowed or that they have to pay for an extra night. It is possible that they might choose to take their business elsewhere. If having the customer stay with you at least two nights is the most important to you, then setting the 2 night minimum is the best option. The reason is that the customer will not run into any restrictions or price adjustments and happily complete the reservation and enjoy 2 wonderful nights at your establishment.